We take a look at the main components and differences of road shoes to help you decide what’s for you. Road cycling shoes may all look similar with sleek lines and stiff, slippery soles but they are packed with features which can make a massive difference to your performance and comfort. OK, so they all are basically two sections; an upper and a sole but like all accessories in cycling, when you start to look closely there are so many variations it can become bewildering to decide what’s best for your needs. The sole is the heart of a road cycling shoe and has the most impact on performance. The stiffer the sole the less energy is wasted; all power is sent straight to the pedal. The downside is they are not as comfortable as ones with a bit of padding or a material that offers some cushioning from road vibrations through the pedals. Therefore there’s got to be a balance struck. Racers will forgo comfort for speed while most leisure cyclists would prefer a little more comfort for a little less efficiency. Bumpers on the heel and toe also save them from wear and tear as these are the points in most contact with the ground and when engaging the pedal. All cyclists love a bit of carbon. The stiffest and lightest soles are those made from carbon fibre and also the most expensive. Yes, the wonder material has made its way into shoes and is way more common than you might think. The only downside – apart from expense – is that it can be unforgiving so is better suited to riders who want a lighter more energy efficient shoe. Saying that, most composite thermo plastic soles these days are plenty stiff enough even for racers and allow a bit more give for comfort without wasting that much energy. Pre drilled holes for cleats and ventilation channels. Road cycling shoe soles come with pre-drilled holes for clipless pedal cleats to attach to. Most clipless pedal systems have a three bolt cleat pattern in a triangular shape with the tip pointing to the front of the shoe. Some shoes are available with four bolt hole cleat patterns too. These are for low-profile direct-mounting of Speedplay pedal cleats. 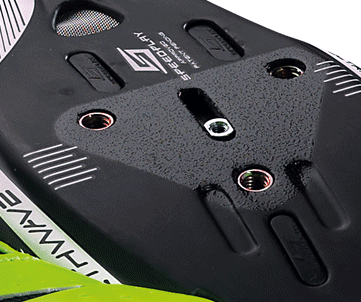 Most soles have a marking system near the cleat holes for easier replacement and adjustment of cleats; trust us you’ll appreciate this down the line when you have replace worn cleats. It’s worth mentioning that cleats are never sold with shoes, they are supplied with pedals and are also available on their own. Air channels help cool the feet. Most soles also have small grooved openings at the front of the shoe to allow air to pass through and cool the feet. This actually works better than you may think in warm conditions but in the winter can be uncomfortable but easily managed by taping them up (from the inside of the shoe). It’s not a deal braker when buying shoes but it’s nice if you have it. 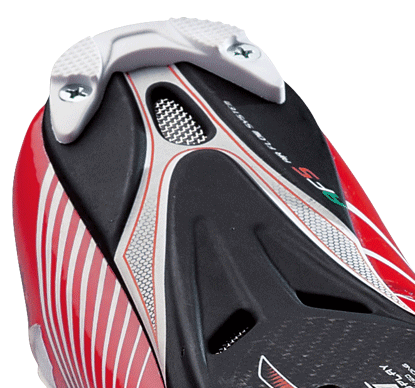 The latest innovation in road shoes is the ability to heat mould the sole to your foot shape. Several manufacturers are now supplying shoes which can be custom fitted (in your own home) simply by heating the shoes in the oven and then shaping them to your foot. Most of these types of shoes can be heated as many times as necessary until you get the perfect custom shape. Prices tend to be higher for these types of shoes but the level of fit and comfort is incredible. 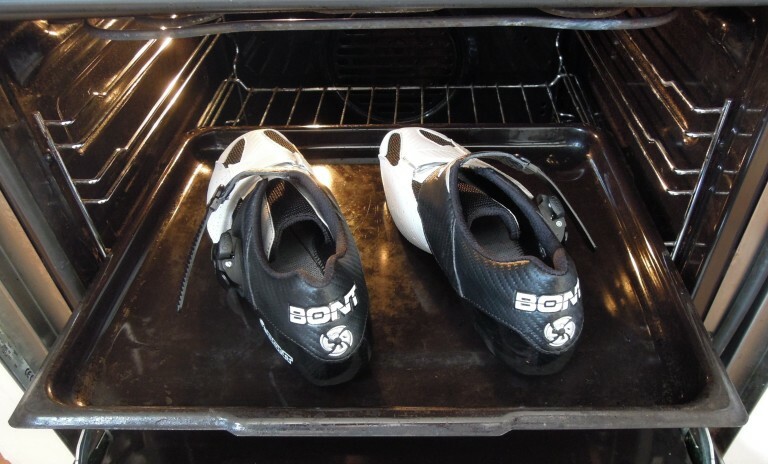 Thankfully the price has started to fall, with Bont offering the heat mouldable plastic sole Riot for less than £100. Just make sure you follow the manufacturers’ instructions VERY closely when carrying out this procedure and don’t mix up your Fahrenheit with your Celsius! Watch the temperature and the clock. While the sole may determine the efficiency of the shoe, the upper determines fit and comfort. The synthetic or leather uppers keep the weight down whilst reinforced toe boxes help prevent damage from scuffing and the reinforced heel keeps the rear of the foot in place. Like most things in cycling, the more you pay the lighter they get and more features they have including the tensioning system. 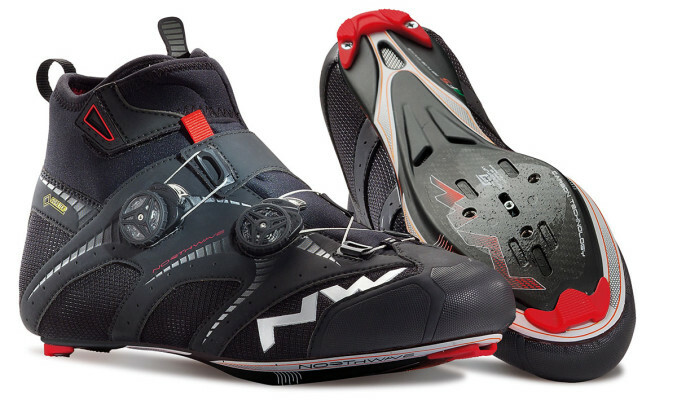 There are several different types of tensioning systems on road cycling shoes; Velcro, laces, ratchet and dial, all of which are strategically positioned to hold the foot in place as best as possible in the shoe. The most basic and easiest way to tighten shoes is with Velcro straps and the more straps the better the fit as they hold several different parts of the foot. Two is good but three is better. Triathlon specific shoes only have one large strap to save time putting on and removing the shoe. Velcro fasteners also tend to be the cheapest method of tensioning but don’t let this put you off as they are also arguably the most reliable as there are no plastic parts to break or wear out. Ratchet buckle systems hold the shoe tighter than Velcro and are easy to adjust on the move. They are used with one or two Velcro straps to hold the foot firmly and evenly in place in the shoe. Dial systems use a wire which is laced through the shoe with the turning of the dial tightening and loosening as appropriate. It’s very lightweight and gives superb fit but is expensive so tends to be found more on top end shoes. Laces are making a comeback in road cycling shoes but ironically they are only found on expensive shoes. It’s a bit of a retro/heritage type thang. They do offer the best way to get the fit you want but can be fiddly and usually take a few goes at getting it right, when you do though it’s well worth it. Another thing to bear in mind is the amount of ventilation the shoes have or better still how much do you need for where or when you do most of your riding. Uppers have various small holes in places to aid ventilation as well as strategically placed mesh panels. Winter-specific shoes have a thicker upper and higher heel and some even a GoreTex membrane to help keep the elements out. Winter specific have fewer vents. Which road cycling shoes should you buy? Leisure riders – Go for comfort and ease of use rather than the stiffest sole and latest fastening system. 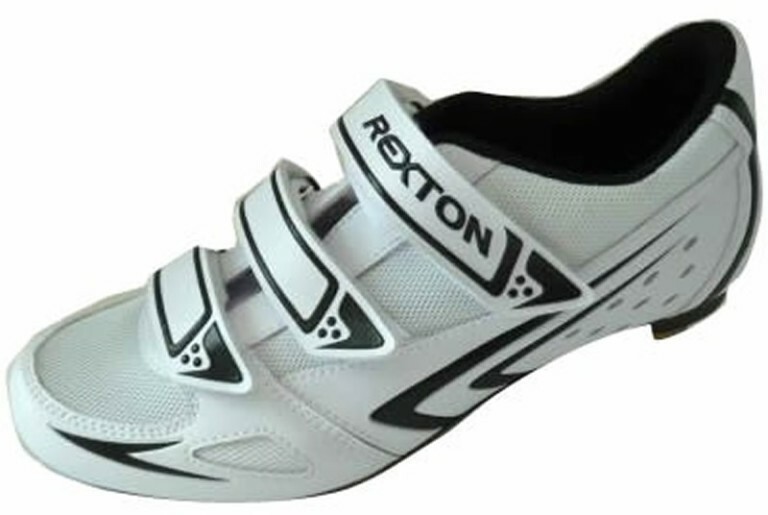 Velcro straps offer plenty of security and no need to got for leightweight carbon soles as any road specific cycling shoe will be stiffer than the trainers you may currently be using. Prices are also lower but you still get a very good shoe. Regular enthusiasts – Choose a stiffer sole than a basic shoe as you will appreciate the energy efficiency. This should not be at the expense of comfort though as long rides will be more enjoyable with a slightly more forgiving sole. Rachet retention system will also be easier to tighten and loosen on the move which is handy on longer rides. Racers – You’ll need the stiffest sole and best retention system. You don’t want any wasted energy so a lightweight stiff sole and a tight fitting shoe will result in less power lost. As long as you aren’t spending hours and hours in these shoes then comfort will be sacrificed, to a degree, as efficiency is key. Tagged bont, buyers guide, northwave, pedals, rexton, Shimano, shoes, sidi. Bookmark the permalink.